The Founder Chairman and CEO of COOPERATIVA DE SERVICIOS MÚLTIPLES DE TECNOLOGIA AVANZADA R. L. (Cooptavanza R.L.) – Mr. Moe Alharazi – had the knowledge and leadership skills but did not have an online solution to address their Credit Union based Banking needs including Credit Union Official login, Credit Union Cash management and Customer and Corporate accounts management. Moe desperately needed an able technology partner who can build a solution for Credit Unions and help him take his business forward. During his search, he went through various options but ultimately chose SOL Banking. COOPTAVANZA R.L is supervised by INSTITUTO PANAMEÑO AUTONOMO COOPERATIVO (IPACOOP) registered resolution DRC/P-J N2 6-2015, and has its certification under IPACOOP N Q 7398/2015, al Tomo 1107 del Registration de Cooperativa Formed in 12 de April de 2015. COOPTAVANZA R.L is the first multiple service mobile technology Credit Union in Panama and officially opened its corporate office on June 12, 2015 in Santiago, Veraguas, Panama. Moe was keen in getting a solution ready for his Credit Union and his first priority at COOPTAVANZA R.L. was to address his customers (both Personal and Business) with Multi Currency Account for different Account Types namely Payroll, Merchant, Business Saving, Preferred, Retirement, Avanza Saving, X-Mas, Regular Saving, Avanza Mobile, Employment Fund, Short Term Deposit, Long Term Deposit, Investment and Membership. “Client base is huge with around 450 credit unions in Panama and Latin America alone. If we tie up and are able to deliver to our customers, you don’t know how much you are going to earn from this.” Moe said with a satisfied look on his face. The scope for growth was indeed huge as SOL Banking planned to dive full on in “Un-treaded Waters”. The first priority with SOL Banking was how to amend the current system so that the same is workable for Customers in Credit Union. This included extending account types to have many others for selection and then tying up the currency factor for each account type so that multi-currency functionality can be extended. Other exclusive features that were to be implemented was “Email Money” where a customer would be able to send money to other accounts in a secured manner over the email and “Corporate Account” where many users would be able to check the same account like Board of Directors having access to the common company account to see the inward and outward money flow. A customer portal along with the Customer login App for android devices was also to be developed before the system could go live. “Once we are done with all this, my friend – we would then focus on ATM switch and Wallet solutions for Credit Unions across Panama and Latin America” said Moe after confirming the order with us. 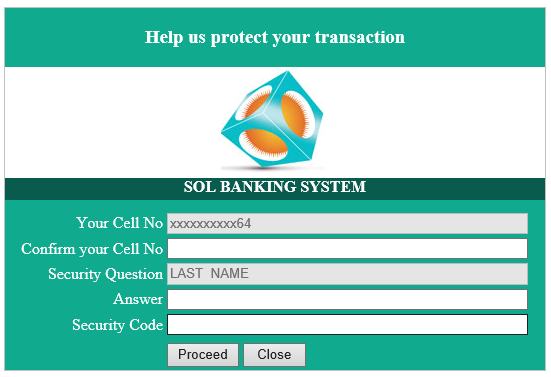 SOL Banking system was first modified to accept multiple Account Types both for Personal and Business Accounts. The Account opening form was modified to include Currency and the Account number generation logic was changed to include the Currency part for recognition of account. 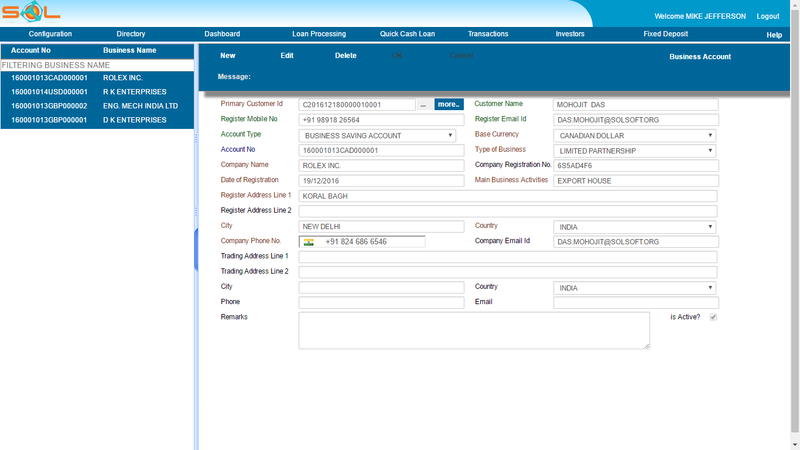 Multiple currency transfers inside the bank with conversion rate and amount capturing was provisioned in the SOL Banking system. Account structure was further modified to make Corporate Account related changes where information in one account can be shared with multiple users linked to the account. “Corporate Account handling is a must for a credit union since a credit union is formed on those principles. 11 members put in some money to open a Credit Union and each one should have access to all the information to the Credit Union account since they all are founder members.” said Moe. Email money provision was provided where clicking on a link received in an email would take the receiver to a link to login to his account to confirm the transfer of funds from the other party. All this was handled in a secured manner so that the transaction is transparent to both parties – initiator as well as the beneficiary. SOL Banking system on the whole took 60-70 days to incorporate these changes and delivered the first version which was released on December 15th 2016. The Customer Portal was the next to be released on January 10th 2017. Finally the Android App was the last release on January 27th 2017. The solution provided also recently incorporated, the SOL OTP token generation on mobile devices which added a new dimension to security of the software besides the password. When a user is prompted for a one-time password on his login page after entering his username and password, they are asked to launch the mobile OTP app to see the current OTP on his mobile and then he can enter the one-time password via the keyboard. COOPTAVANZA R.L. finally had an Online Banking solution for its Credit Union where transactions can now be managed digitally. Moe’s idea to have a Credit Union Banking solution had worked and the Corporate Account implementation was a major success with the Credit Union members. Customers found the email money related functionality very impressive and now small time period based accounts (like X-Mas, Avanza mobile) can now be opened with COOPTAVANZA R.L. Moe is planning for phase 2 where Wallet solutions would provide the customers with an international wallet where both pay-in and pay-out would be possible at any location. The ATM switch integration would provide the customers with the advantage to withdraw money from any part of the world as Credit Unions plan to tie up with local banks in different countries.